57 ROSSI, G.G. 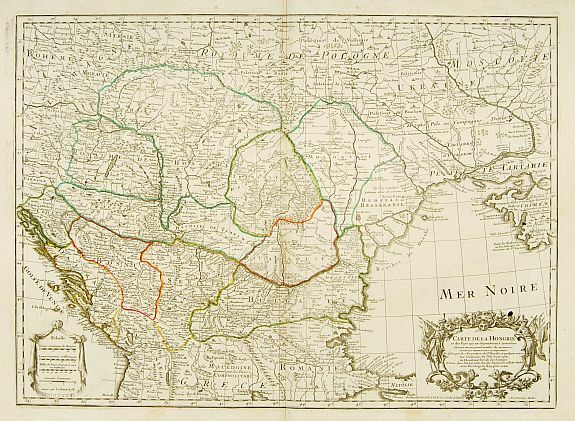 Il Regno d'Ungaria Transilvania, Schiavonia, Bosnia, Croatia, Dalmatia� ( Rome, 1683) Col. Marges courtes. 425 x 545 mm. 58 L'ISLE, G. de. Carte de la Hongrie.. ( Paris, 1780) Limites en col. d'�poque. - In good condition. Ink spot in the title cartouche. 469 x 648 mm. � Detailed map of Hungry. Depicting the surrounding countries from Croatia to Russia and from Poland to Greece. Decorative title cartouche. 59 SANSON, N. Coste de Dalmatie� ( Paris, 1664) Infimes rousseurs. 405 x 555 mm.